In the past we’ve dinged The Economist for selective use of photos to illustrate a news story; thereby making a subtle editorial statement. The NY Times has done the same in today’s edition to have a little fun with Joe Wilson. You may recall Joe’s 15 minutes of fame when he called President Obama a liar during a speech by the President to a joint session of Congress. Before his outburst nobody outside of South Carolina had heard of him, and since then he’s regained his previous anonymity. 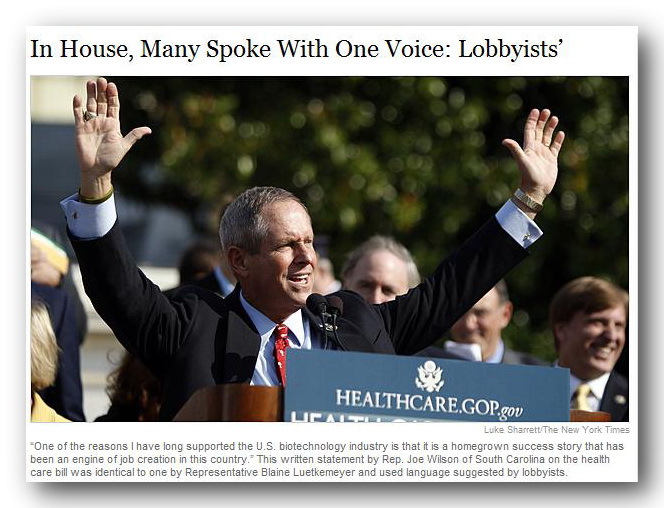 Big Joes’s profile got upgraded this morning when the NY Times ran a story about a Genentech lobbyist who ghost-wrote statements for members of Congress to insert in the Congressional Record during the Health Care debate. The ghost writer was courteous enough to craft one version for the Republicans and another for the Democrats. And it was dutifully picked up by 42 members of Congress; 22 Republicans and 20 Democrats. Who, when asked about the identical wording in their statements, promptly laid the blame on their staff people. Our Congress is a courageous lot. And out of the 42 candidates vying to get their picture used to illustrate the story, can you guess who the Times editorial staff chose for this honor? You guessed it, Joe Wilson. Who knows, maybe he’s the most photogenic. Just to set the record straight, I’m not on Joe’s side, and figure he probably deserves whatever he gets. Lack of civility cuts both ways. And speaking of a lack of civility, to say nothing of basic intelligence, follow this link for an update on the real Origin of Death Panels, where Joe gets another small mention.